Do you ever feel stuck when you can’t find a party treat that is different from what you’ve been making for a long time? Are you bored of making the same cake all the time when you invite your friends to your home? If you tried Candied Peanuts, I’m sure they were the winner. But I want to share something even more attractive this time. Sprinkles Chocolate Popcorn will definitely become the hit at a party of any kind. This is one of the simplest treats ever with just three ingredients. You need popcorn, melted chocolate and sprinkles. If you want to make your own popcorn, you will need to add two more ingredients to the list that you always have in your kitchen: olive oil or any other kind of oil and salt. 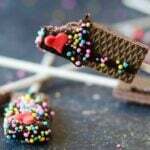 If you are fed up with cookies or cakes and if you are looking for a snack which goes wonderfully with movies or games, you should definitely try this chocolate popcorn fancied up with sprinkles. Popcorn is fun. Chocolate is fun. When sprinkles are involved, everything is even more fun. Can you imagine what happens when these three fun ingredients are all combined in one treat? You can prepare chocolate popcorn in 10 minutes! This time is even shorter if you buy packaged popcorn. But if you love making things from scratch as much as I do and think that making popcorn is fun on its own, make it yourself with your regular method. We don’t have a microwave because I read many negative things about it and decided not to buy. I don’t need it at all. So I use mom’s method of making popcorn; the stove top method, which always works fine. All you need to do after having a large bowl of popcorn is to coat them with chocolate and sprinkles. This chocolate popcorn is definitely an easy and crazy tasty snack, which will become one of your specialties. If you want to go even more crazy with popcorn as a party food, you should see this Holiday Popcorn Bark, which additionally has m&m’s and pretzels. Three fun ingredients combine and make this wonderful party food! Put olive oil, corn kernels and salt in a large pot, stir. Heat it on medium high heat, stirring for about a minute and then put a lid on it. Pop the kernels shaking the pot occasionally. Don’t remove the lid. It’s done in 2-3 minutes. Transfer melted chocolate on parchment paper and toss in popcorn. Let them coated with chocolate. Toss sprinkles on them and serve in bowls.